Open top hoppers have fixed sides and ends with open tops and two or more openings on the bottom for rapid discharge unloading. These cars are designed to transport industrial minerals, crushed rock, sand, gravel, and metallic ores. 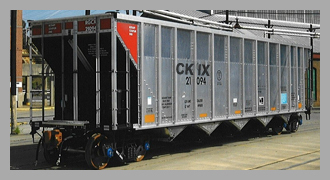 The larger cube cars can accommodate lower density products such as coal. See tabs for specific open hopper specifications.